1. This Resistant Silicone Solder Mat is an ideal product for soldering electronics assembly or electronics and circuit board repair: smartphone, laptop, computer, sports watch, camera, smart toy, and much more. 2. This multifuntional maintenance heat resistant mat can withstand high temperatures over 932F to protect working table. And you also use it big pads as pot holders for pots, pans, trays, baked and more. You can even place it that is heat-resistant, non-slip on tables or counters for pots and pans. Repair Mat：The size 13.8 x 9.8 Inches ,and it is a perfect electronics mat for repairing watch,mobile phone, computer circuit board, ipad, camera so on different size electronics. 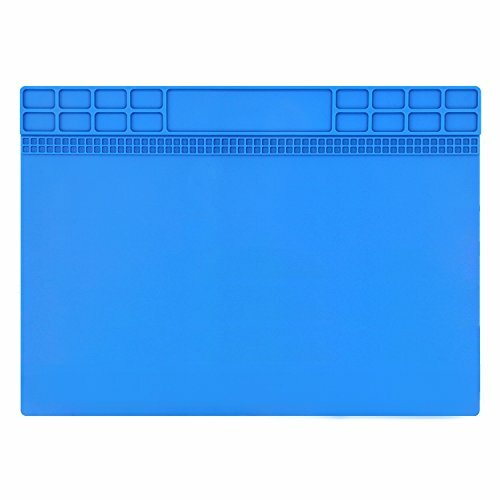 Never Worry About Damaging Your workbench : The Silicone Soldering Mat is High Temperature Heat-resistant .Suitable for electronic maintenance, temperature resistance to 932°F (500°C), which can protect your workbench from being damaged by high temperature. This is a great protection mat for your workbench or desk. Anti-slip: Non-slip table mat is chemical ans abrasive resistant;Great use for electronics repair.And easy clean with soap and water. Multiuse Grids Design Let You No More Miss Any Small Screws or Parts: The 115 raised "compartments" as containers for screws resistors, batteries and small electronics would be perfect for keeping things organized,help your workplace a lot neater. Flexible Using In Your Daily Life：Great silicone repair mat can be used for any electronics repairing or soldering project, such as mobile phone, Ipad, watches or computer, electronic assembly, circuit board maintenance, hot air gun welding.Also applicable to your daily life, such as the kitchen, baking house , hair salon ect anywhere you think it can be helpful. If you have any questions about this product by Gihunk, contact us by completing and submitting the form below. If you are looking for a specif part number, please include it with your message.